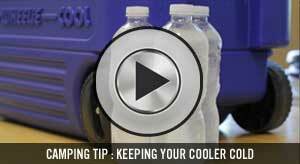 The Double Cooler provides a five gallon container that is wrapped around a two gallon container. There are two faucets at the front where the user can tap from each container. 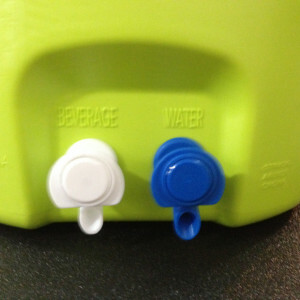 The five gallon container is suitable for using a five gallon powder mix of beverage product with water (or your favorite mixed drink). The center container is filled with ice. 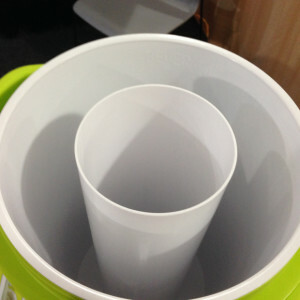 The ice container cools the beverage without dilution. As the ice melts, it provides a chilled water option for the user through the faucet. Their unique lid is designed for when you have beverage left in the five gallon container and some of the ice has melted in the two gallon container. 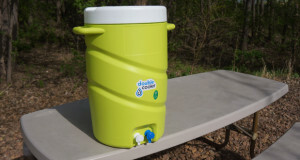 You turn the lever on top of the lid to the drain position, tilt the cooler to either side, the water from the center container will drain out retaining any left over ice without the remaining beverage in the five gallon compartment draining out.